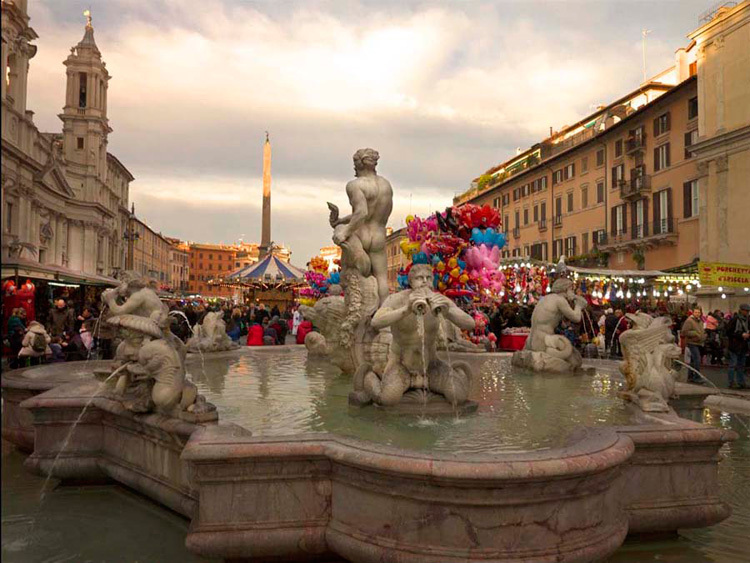 From Massachusetts to Italy… in search of the soul of the nativity scene Three years in Italy – stopping off in Rome, Naples, Lecce and Matera – to study and take photos of nativity scenes. 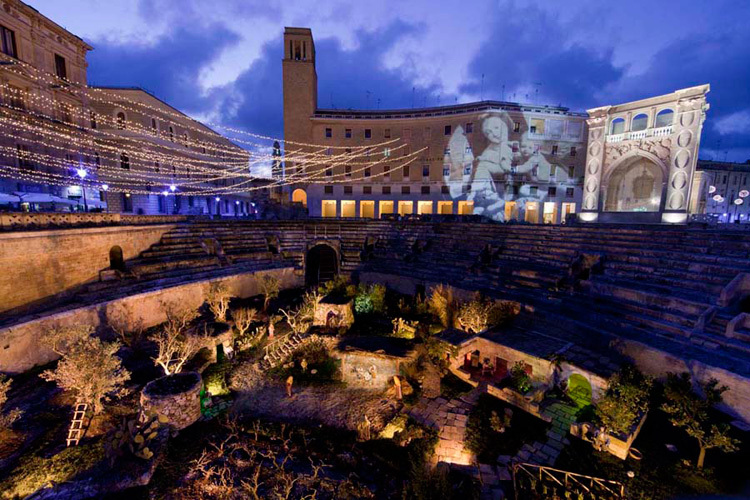 Late on a brisk December night we are leaning over the railing of Lecce’s ancient Roman amphitheater, looking down past the tiered stone seating to a manor farm, or masseria. Below, on what was once an arena for feats of hunting, flagstones now lead from a flat-roofed stone farmhouse to a tidy vineyard and a kitchen garden growing a healthy stand of fennel. At a table outside the front door a woman slices orecchiette while her husband sweeps the stones on the terrace. Gnarly olive trees dot the farm, one with a ladder reaching into its branches, and a young boy watches over a sleeping lamb. Only nobody, and nothing, is moving. What we’re looking down at is not a real masseria at all, but Lecce’s presepe, or nativity scene, the city’s annual Christmas installation. The scene, lit by low lights, has an uncanny realism. The prickly pears look remarkably like the cacti dotting Puglia’s abundant olive groves. Are these actual tufa rocks, the ubiquitous rocks of Puglia, or polymer look-alikes? Living olive trees, brought in and planted for the month the presepe will stay up? Together with photographer Margot Balboni I’ve come to Lecce, a gem of a city in Apulia, the heel of Italy’s boot, on the trail of nativity scenes. It was in 2005, while a visiting artist at the American Academy in Rome, that Balboni stumbled into a room at Cosma and Damiano Basilica. There, illuminated in the dark, was a dramatic eighteenth-century Neapolitan presepe, crowded with elaborately clothed gesticulating figures. In 2011, when I mentioned I had a fellowship leave, Balboni suggested we go to Rome and look at presepi. Thus began a three-year journey that was very much driven by the artists, collectors, historians and curators we met along the way. Italians date their rich history of the presepe to 1223, when St. Francis reenacted the Nativity in Greccio. 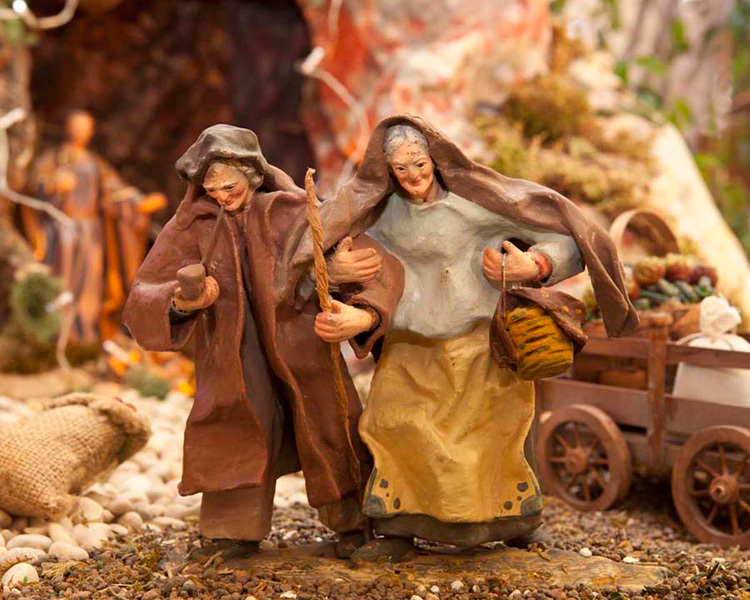 Through the centuries the presepe has developed a history deeply entwined with Italian art and culture. The Italian presepe is a vibrant form of installation art practiced all over Italy by everyone from school children to the most highly trained artists. The story is always the same, but the personal act of making a presepe continuously re-energizes the story. In Rome we visited the workshop of the “Amici del Presepio” at the church of Santa Maria in Via, where volunteers meet weekly all year long building the annual installation. We were welcomed into the home of a retired attorney in Rome as he hammered together his presepe in his living room, and then followed his advice to head down to Lecce, his home city and source of his papier-mâché presepe figures. From the 2012 presepe in St. Peter’s Square, featuring the sassi of Matera, we traveled to Grassano, a hill town in Basilicata, to meet Francesco Artese, the artist who was commissioned to design and build it. 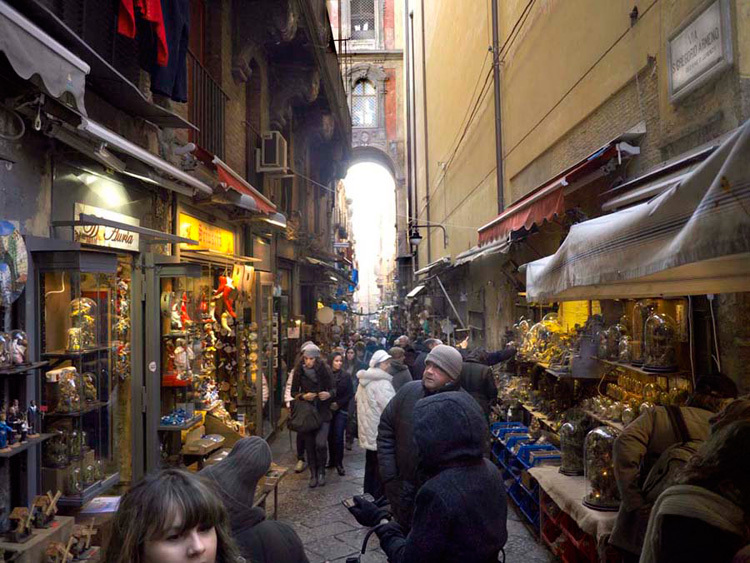 Everyone we met directed us to Naples, the baroque center of presepe art, where we wandered the shops of San Gregorio Armeno, met with collectors and restorers, and visited the historic eighteenth-century presepi at the San Martino Museum and the Palazzo Reale. 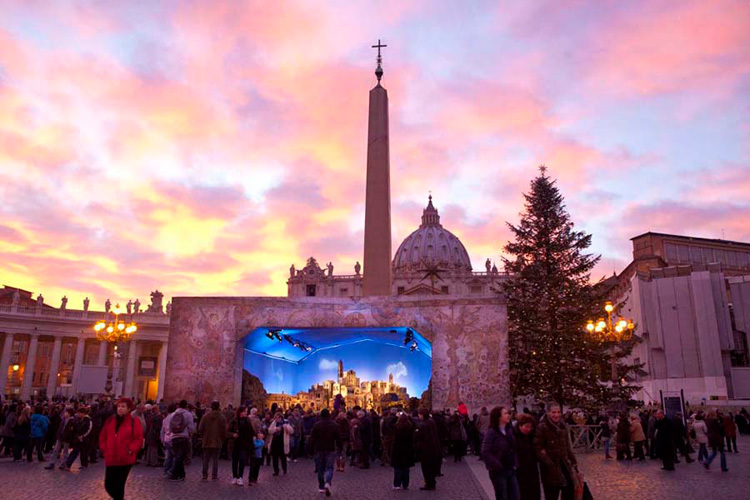 “The Italian Presepe: Cultural Landscapes of the Soul,” is the culmination of this journey. A new exhibit at the College of the Holy Cross in Worcester, MA, “The Italian Presepe” features approximately fifty of Balboni’s photographs of nativity scenes from the thirteenth-century to today, along with photographs of artists at work in contemporary workshops in Rome, Naples, and Puglia, three regions where the presepe has developed distinct regional styles. Each presepe, a miniature cabinet of memory, is a palimpsest of Italian art and culture. Balboni uses antique frames to move the images beyond documentation into memory, and has juxtaposed them with historic maps and etchings that draw out their inner themes. On display are also an exquisite eighteenth-century genre scene, The Cheese Vendor, along with 2 musicians and a large archangel borrowed from The Carnegie Museum of Art. Alfred Walker, an art collector, has loaned the exhibition his wonderful “scarabattolo,” a traditional glass case filled with an unrestored nineteenth century nativity scene. The Knights of Columbus Museum of New Haven has contributed two contemporary presepi by living Italian artists. 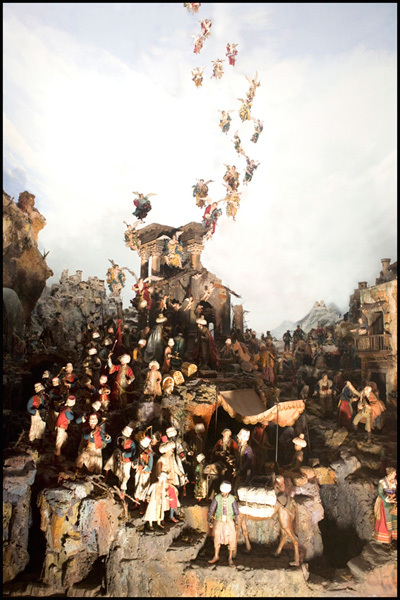 * “The Italian Presepe: Cultural Landscapes of the Soul” is free and open to the public from September through December 2014 at the Iris and B. Gerald Cantor Gallery at the College of the Holy Cross in Worcester. An 80-page color catalogue, with photographs by Balboni and an essay by Stanbury, is available for sale at the Gallery and through its website.